This post is sponsored in conjunction with #BrunchWeek. I received product samples from sponsor companies to aid in the creation of the #Brunchweek recipes. All opinions are mine alone. Cheesy Ham Egg and Asparagus Breakfast Pizza made with a homemade pizza crust, diced ham, asparagus, and sunny-side up eggs, is perfect for brunch! Welcome to Day 5 of the fifth annual #BrunchWeek hosted by Terri from Love and Confections and Christie from A Kitchen Hoor’s Adventures. We are so excited to have you join us this year as we celebrate Brunch and prepare for Mother’s Day. Forty Bloggers from around the North America will showcase their best brunch dishes, from cocktails to cakes, danish, tarts, and pizzas – with 170 recipes, there is something for everyone! Our amazing Sponsors have donated some great prizes for the #BrunchWeek giveaway. Thank you so much, Sponsors, for your generosity. 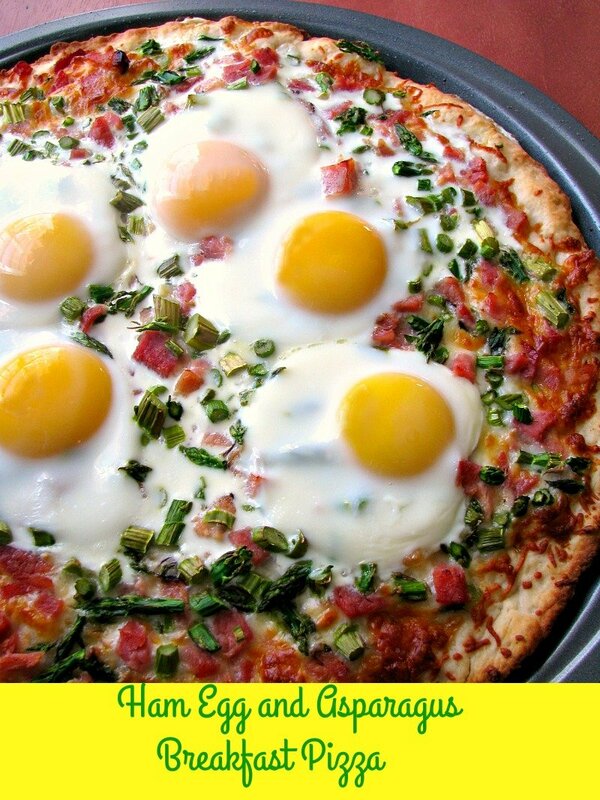 I should have started making breakfast pizzas with a sunny side up eggs years ago! A runny yolk over a cheesy crust is amazing! When you add ham and asparagus, it’s even better. I could seriously eat it for breakfast, brunch, lunch, and dinner all week long! Even Amanda liked it, without the runny yolk. As you can see in the picture above, you need 6 eggs if you want every piece of the Ham Egg and Asparagus Breakfast Pizza to have a full egg on it. I made this Ham Egg and Asparagus Breakfast Pizza with returning #BrunchWeek sponsor Red Star Yeast for the pizza dough, and new sponsor Michigan Asparagus, the largest supplier of asparagus in the United States. I love Red Star Yeast for making pizza dough, and nothing beats fresh asparagus. Well, maybe this pizza does. 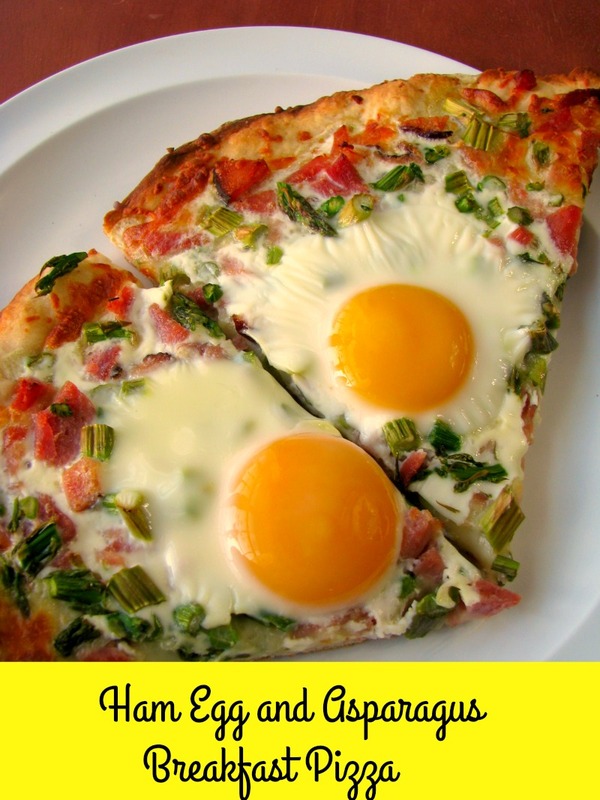 Read on after the Ham Egg and Asparagus Breakfast Pizza recipe to see all the other delicious #BrunchWeek recipes shared today. WANT EVEN MORE DELICIOUS RECIPES FROM MYSELF AND MY FAVORITE FOOD BLOGGERS? FOLLOW ME ON PINTEREST, INSTAGRAM, OR FACEBOOK, WHERE I SHARE NEW RECIPES DAILY. YOU CAN ALSO SUBSCRIBE BY EMAIL TO GET NEWLY POSTED RECIPES FOR FREE! Cheesy Ham Egg and Asparagus Breakfast Pizza made with a homemade pizza crust, diced ham, asparagus, and sunny-side up eggs, is perfect for brunch! 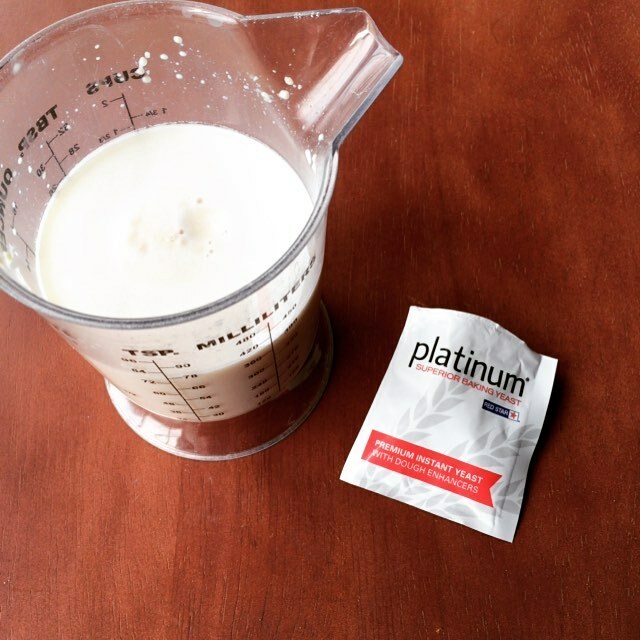 Combine the yeast and 1 teaspoon sugar in a large bowl. Stir in the warm water and let it sit for 5 minutes until foamy. Combine the flour, remaining 3 teaspoons sugar, and salt in another bowl. Stir the flour mixture into the foamy yeast until all the flour is incorporated. Roll out onto a floured surface and knead for 5-6 minutes, adding additional flour as needed to keep the dough from becoming sticky. Using a kitchen scale, separate out 16 ounces of dough. Let the both sets of dough rise, coated in 1 tablespoon olive oil each, covered, and placed in a warm place for 1 hour. If no scale is available, simply divide the dough into one slightly larger half and one slightly smaller half, then proceed with the rising. You will use the larger half for the pizza, and save the remaining dough for another use. It can be refrigerated for 3 days or frozen for 1 month or more. Once the dough has risen, punch down the dough to remove air bubbles, then spread the dough out onto a greased and lightly floured round 12-inch pizza pan. Top first with the cheeses, then the ham and asparagus. Bake in the preheated oven for 10 minutes. Break the eggs into individual small bowls. 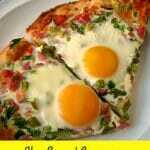 After 10 minutes, remove the pizza from the oven and carefully pour each egg separated equally into the the pizza. Place back in the oven for 3-6 minutes or until the egg whites are completely white have begun to set, keeping in mind that the eggs will continue to cook from the heat of the pizza. Let sit for 3-5 minutes before slicing. Prep time include dough rising time. Disclaimer: Thank you to #BrunchWeek Sponsors: Red Star Yeast, Dixie Crystals, Cabot Cheese, Nielsen-Massey, Rainier Fruit, and Michigan Asparagus for providing the prizes free of charge. These companies also provided the bloggers with samples and product to use for #BrunchWeek recipes. All opinions are my own. I think this would be such fun to share at a brunch.